How likely was it that a bandit would eventually have a bandit theme? Well, you've found it, in the name of Playtech's Safecracker slot. This 3 reel and 1 pay line slot adventure sees you battle it out, trying to pull of a memorable bank job and walk away with the safe, progressive jackpot. Designed to look far sexier than a lot of other slots on the market, the game features a sleek design, stunning graphics and sound effects to add to the realism (if it could be so) if breaking the bank, and robbing their loot. The Safecracker symbols are designed in accordance with everything you might need to pull off a mighty bank job, with cash, dynamite, a drill, a key, and safe cracker tools all at your disposal. Of course the aim, as with all slots is to line up the winning symbols on your pay line in order to pick up the progressive jackpot, which is made up of fragments of each bet wagered by all the gamers. The winning symbol in Safecracker is rather predictably the cash symbol. Collect three of them and you'll find yourself with the progressive jackpot. Despite their being only one pay line, there are multiple way to bet, with coins denominations being accepted in £0.25 to £5. In order to qualify for the progressive jackpot, should you be fortunate enough to win it, you'll need to bet the maximum amount of 3 coins at £5 a coin. So £15 a spin in all! There is more to win than the big prize though in Safecracker. Gathering 3 cash symbols whilst playing with only 2 coins will still see you £20,000 richer, whilst 3 cash symbols on your pay line with only 1 coin still brings you to a rather sizeable £10,000. 3 dynamite symbols isn't too shabby either, netting you a tidy £1,500, although you'll again need to bet the maximum of 3 coins to win this set. Safecracker comes with a Bonus Game too, and three keys will see it activated. Once you're in the bonus game, you'll find yourself met with ten safe deposit boxes. Seven contains riches that you can walk away with, and three contain nothing. What box you end up with is really down to you. You know what they say, use your instincts, your first guess is often the right one! Well that about does it. Although the stakes are pricey, the reward of cracking open the safe are somewhat justified, so again it really down to you. 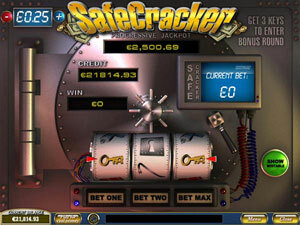 If you think you have got what it takes the beat the banker, and rob his loot then Safecracker is for you. If you find the wagers too high for your modest balance, then there are lots of similar games out there, even similar themed that might tickle your fancy more, but none will be as enjoyable as Playtech's perfect bank heist slot.